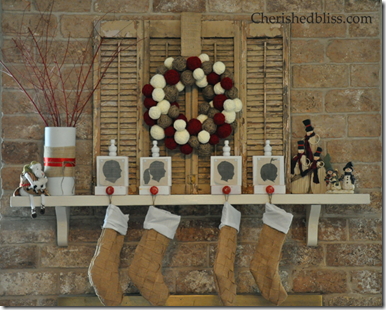 52 Mantels: Mantel Monday Christmas Features! Welcome to our FINAL Mantel Monday before Christmas. Wow! I can't believe we're less than a week away from my favorite holiday! This Monday I haven't really created a new mantel, I've just kind of combined elements from my other mantels. And, yes, this is the mantel you saw on Saturday when I gave the Christmas Tree Tour. The big news is that I finally got a stocking for my lil' punkin. It was only $6 so I won't feel guilty when I finally decide what I want our family stockings to be. So many choices, how will I ever come to a decision? Oh, life really is complicated. Instead of going on and on about a mantel that isn't all that new, I've decided to highlight a handful of mantels from creative souls who linked up to our party on the 10th! So many amazing Christmas projects were shown! If I featured your mantel on this fine Mantel Monday, go ahead and grab a button. If you're into that sort of thing, of course. 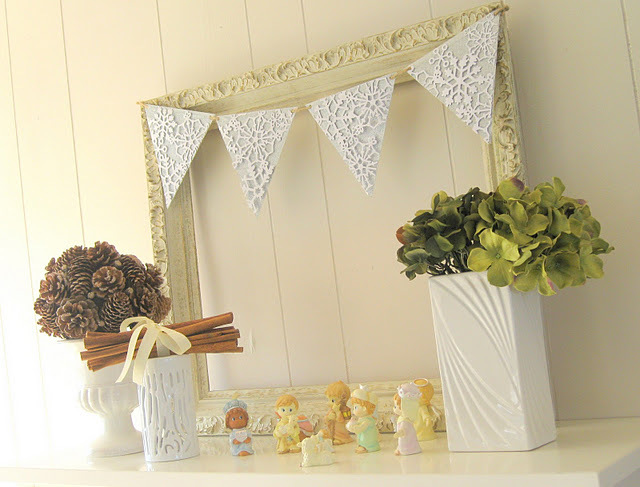 I love this mantel from Cherished Bliss! And, I totally adore the yarn ball wreath. I may have to make a version of that for my winter wreath. It would definitely transition well into January, don't you think? 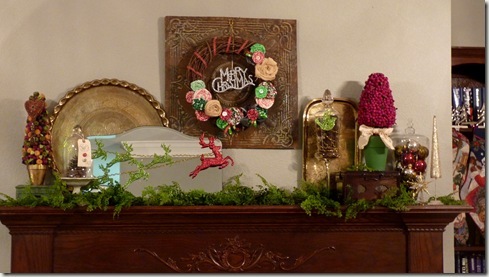 This mantel from It's Overflowing is delightful, just like Aimee! Her hubby used old fence posts to make that cool backdrop. And, I love how the gloss white reindeer constant against the greenery and wood accents. So charming! The combo of greenery, gold and cream from Sarah at Life on Walnut Street is so pretty. I love her paper Christmas trees, too! Head over and pin those for next year! Sarah gives a very thorough description of her process. And, I'm totally confident you could pull it off. This last featured mantel from Space 46 isn't really a mantel, but I wanted to show you how easy it is to spruce up any surface with pieces you'd often find on mantels. Don't you love her combo of whites, creams and natural elements? I bet the cinnamon sticks smell divine. Plus, that snowflake garland is beautiful. She even links you to a tutorial. Another great pin for next year's projects! 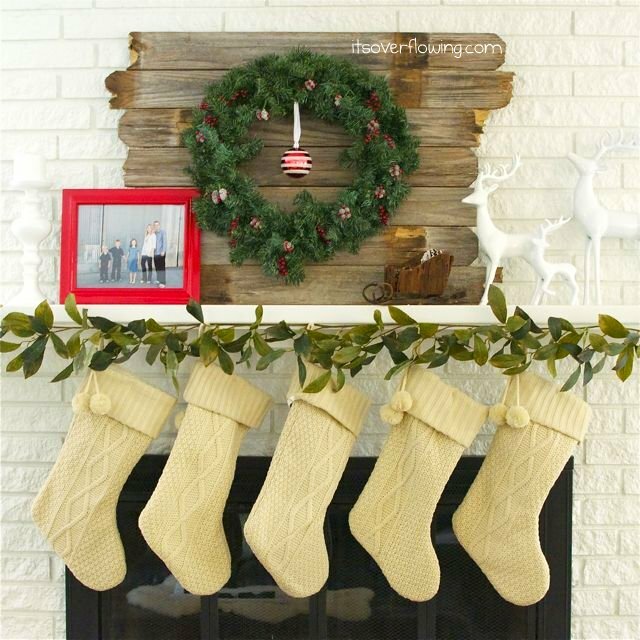 If your mantel isn't spruced for Christmas yet, you now have plenty of inspiration!! Love all the festive mantles! Thanks for stopping by my site! I'm your newest follower! I'm a newer follower and hope that "52 Mantels" doesn't mean you'll stop featuring at the end of the year. Keep them coming! I've posted some pictures of my decor containing some inspiration from you and Pinterest. I'll be getting some chalkboard trays soon too! 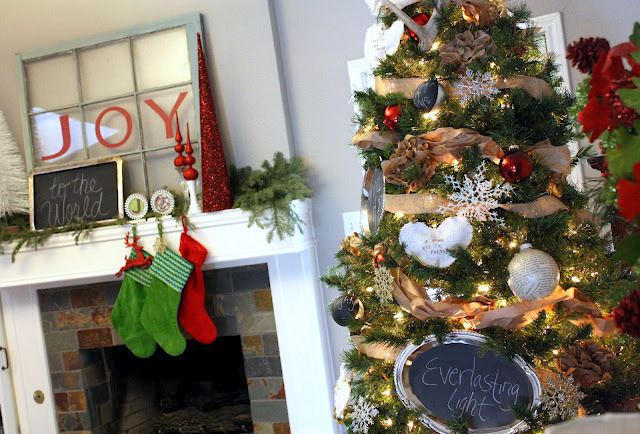 Emily, I love your blog, your mantels and your Christmas Tree. Thanks for stopping by my blog and following along. I am following you too. Warm Christmas wishes to you and your family. I wanted to let you know, I added your Christmas tree post to my FB page. I really like your chalkboards and brown paper flowers. :) Oh, and the gifts in tubs under the tree. Beautiful! Everything is so beautiful! I'm now a follower, thanks for visiting my blog! Great picks! Stopping over from Hating Martha...happy to be following along! Thanks for stopping by my blog & your sweet comments! Following you back & looking forward to sharing more posts between you & me!! Oh so much to love on this post ! I will be pinning many ! thank you for visiting my blog and your kind comments. I am happy to follow you too! Your mantel looks so pretty! 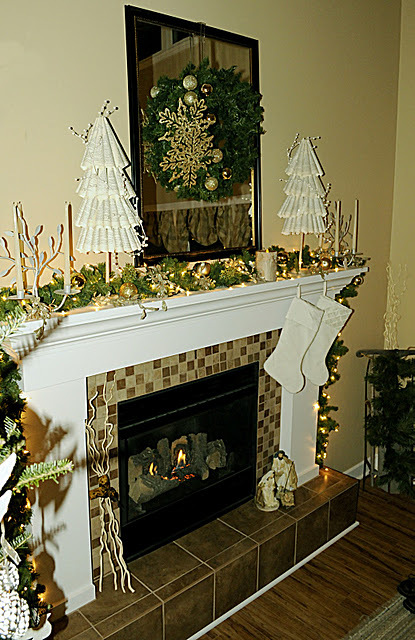 I really like this whole "52 mantels idea". My mantel is huge, so I'm always struggling with it. Thanks for sharing some inspiration. Thanks for stopping by and leaving such sweet comments. I am now following you as well! Emiiy, Your tree is beautiful! Like the kind of beautiful that belongs at a Christmas boutique! I LOVE all your features, too! Thanks for including me in those featured! I LOVE being on your beautiful blog!!! people's attention? I mean "Mantel Monday Christmas Features!" is kinda boring. Just my opinion, it could bring your posts a lirtle bit more interesting.